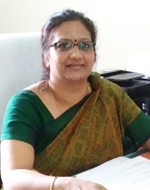 Mrs. Namrata Sharma is an accomplished educationist with a career spanning for more than 26 years. Always brimming with creative vivacity and tireless zeal, she strongly believes that “If you want to shine like a Sun, first burn like a Sun“(Dr APJ Kalam).In her illustrious career, Mrs. Namrata, has been associated with The Delhi Public School Society (from 1991- 2009), The JSW Group (2009-2016) and The Millennium Group of Schools (2016 – 2017). She has many achievements to her credit and has been gravely instrumental in motivating students achieve academic excellence, grooming facilitators and ensuring that the school strives for and attains excellence in all aspects. She has versatile experience in handling children of all age groups from toddlers to adolescents. She completed her education from Nainital and Dehradun, the hub of great schools of Northern India and has finished a German language course from ‘The Goethe Institute, Freiburg, Germany’. She has formerly been the founder Principal of ‘The Millennium School’, an upcoming CBSE school in the NCR region till recently. Mrs. Namrata is deeply committed to providing holistic education to the students which will make a lasting impact in the most formative years of their lives.